There are many ways or scenarios, in which to get involved in the 13th NC, but the main way is to become involved in the infantry. 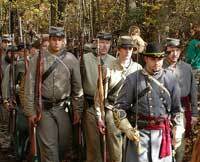 We are always looking for new recruits willing to take the field and reenact the battles of the War Between The States. The 13th North Carolina Field Hospital visually brings the horrors of war to real life. Using real patients or mannequins we can make it seem like the real thing. 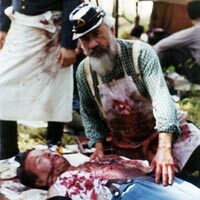 As a member of the Civil War Surgeons Society, I have learned many techniques and applications to truthfully tell the story of 18th century medicine. The Field Hospital has had demonstrations at Museum of the Confederacy, Gettysburg National Military park, Charlotte Museum of History, Reed Goldmine State Historic Site, Endview Plantation, Matthews NC, Davidson NC, Boone NC and others. Also, I have given demonstrations fo the Confederate Medical Department to elementary, middle and high schools, colleges, SCV Camps, historical societies and others. Please contact us if you would like a demonstration.